The following is the 14th message that we received in Avalon (England and Scotland) this past June/July 2012 over Solstice. You can find our other messages on our website at www.alunajoy.com under the "Articles for Personal and Planetary Transformation" link. It might be a good idea to read them in order as each message builds upon the previous one. We are sharing this message here with you just as we received it, in present time, with very little editing. We do this for a very important reason. We know that the messages that we receive are not just for our groups, but are for others as well. The Star Elders and all the others that joined us, assure me that the message and the corresponding energy will be transmitted to you as you read them. So as you read this, you might want to imagine that you are with us. Also, always view the photos on the website that we share, as photos also hold some energy of the sites. Duloe Stone Circle - June 29, 2012 Our local guide and friend, Marcus Mason: Welcome everyone to Duloe. A small group of us have been working here every full moon for the last four years now. I came here first about ten years ago. I felt rather strange here because it felt really beautiful and really intact, but it felt a little bit flat. Then I came here with Sue about five years ago, and she said "Wow! This is all white quartz. I think it comes alive at night." The white quartz absorbs the sunlight during the day, and reflects that energy outward at night. So, we came here on the full moon one cold February morning, and it was stunning. Beautiful full moon up there, and it was like we were standing inside the full moon. It's a lunar site. This is a site that holds and works with the energy of the moon. So we have been working here with the energy of the full moon every month for the last four years. The first year and a half, after seeing that first full moon, we didn't see the moon at all. It rained and it was cloudy and it snowed. So one day we asked the stones, "What is going on?" And the stones said, "We just want to make sure that you're serious." (laughter) And we are. So, welcome to you all. I would like to lead you in a meditation. We will work with the energy of the moon. The moon is behind us somewhere, and it certainly is held in the circle there. There is a line that connects Duloe behind me, from this stone, and it connects up to the Hurlers, which are on Bodmin Moor. The Hurlers is one of the major vortexes and energy centers on the Michael/Mary Line. So breathe in deeply into your heart. Feel your heart opening to receive your breath, opening to receive air from this place. And breathe the air out and down through your feet into the Earth to connect in to this sacred site. Breathe in again. Feel your heart opening more. And breathe out and down into the Earth. Feel your breath sending roots and energy down through your feet into the beautiful Mother Earth. Breathe into your heart; and this time, send your out-breath down your left arm to the person next to you and feel it touching their heart and the person next to them, and so on, until it comes back around to you from your right. Breathe in and send it out clockwise around the circle. Breathe into your heart. This time breathe out and up. Feel your attention and your energy moving up from your heart center to your throat center and from your throat center up through the center of your neck, coming to rest tucked in top of your spinal column under your brain. . . . level with the bridge of your nose. Imagine a flower of light opening at the bridge of your nose. This is the amygdala center-the shamanic center. Breathe in through that center and feel light concentrating-a small pair of lights-tucked in right under your brain, where your brainstem meets your brain. Breathe in the light that looks like the light of the moon, clear milky white, radiant light. With each breath, breathe it in just above the bridge of your nose and try to concentrate it on the brain stem. Feel this light beginning to permeate and irradiate in and around your head, in and around your brain and in the spinal fluid that encircles your brain. Feel it calming and soothing your whole nervous system. As you breathe in, connect with the energy of the moon. Let your breath fill you with stillness and calm, gentle, radiant peace. Feel that gentle, clear, white light starting to flow down your spinal column, flowing in the spinal fluid around your spinal column, around your central nervous system. As that clear, white light flows downward through your body, you can feel it relaxing and calming every organ in your body. The nerves become relaxed, and your spine becomes relaxed. So you allow this wave of soft white light, soft moonlight, to flow down your spine . . . down through your neck . . . down to the level of your chest, to your heart, down to the level of your diaphragm . . . relaxing the diaphragm and releasing any tension: any emotional tension, any physical tension. Feel it flowing down into your abdomen, as it relaxes the organs of your abdomen. Feel it coming to rest just below your navel. Imagine, beneath your navel, cool clear light-radiant pool-like water. Imagine the center of that pool has a reflection of a perfect full moon. The pool is calm and still until you can see a clear image of the moon reflecting in your belly below the navel-reflecting your emotional center. As you bathe in the stillness, this gentle beauty, you can feel the containment of the stones around us. You can feel these beautiful white stones holding the energy of the moon around you. Feel yourself absorbing and assimilating all the experiences that you have had from this journey . . . your feelings and senses . . . feel them coming up assimilating into your emotional body and then into your physical body, so they become a part of you. Feel yourself assimilating everything shared with each other, everything you have shared at sacred sites where you have been, the stones and the water, and the spirit beings of the Earth. Be aware of your every impression, every little previously unnoticed feeling and thought. Feel yourself filled with gratitude and wonder for this journey-knowing that your call has been completed and that you will always be a part of this whole. Breathe in deeply into your belly, and breathe out through your legs into the Earth. Breathe in deeply, and out and down into the Earth. Breathe in, and out and down into the Earth. The group finished with a final Om. 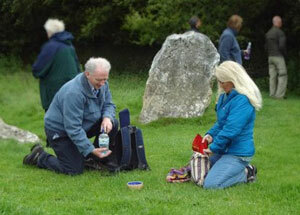 Aluna begin to share her insights and message: These stones make a chalice that goes deep into the Earth. We have been working, polishing, clearing, and emptying out our chalice within. As we were doing this mediation, I saw a little flame begin to grow inside our chalice, a little flame that is like a germination of a seed that we have picked up and tended to on this pilgrimage, and now it has caught fire. This is a new fire inside of us, the one we will take home across to the four corners of the Earth. The Guardians here and the ones that have been walking with us on this journey know that it's the last day for some of us, and they are wrapping you in a beautiful light to send you home in a silken blanket . . . a shelter for this little tiny flame, so you can get home with this flame still burning brightly. As for the rest of us, we will carry our flame with us onward up north into Scotland until we are completely finished with our journey. At that time, they will blanket our flame as well. Also there is something being placed underneath our feet. It is very solid, yet it looks like light underneath our feet. It looks like a disc of some sort. I don't quite understand it; but when I ask the Star Elders, they say it is "our new footing in the New World." So over the last eighteen months (2011-2012) or so, they have moved our hearts; they have moved our minds; they have moved our chakra systems to a new frequency, bandwidth, or dimension, etc. They are now putting our feet down upon a golden disc. This is the beginning point, or foundation stone, from which we are to build a New World. 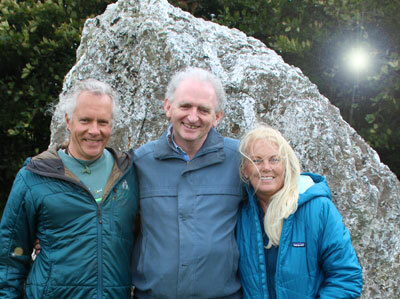 Now looking back at the stone circle, I can see that the energy goes through the golden disc of light that we are standing on, and goes all the way to the core of the Earth. Outside this circle it looks like golden light, an opalized light; but when you look inside, it is filled with gold. On the bottom of the stone's chalice, there is a tiny, multicolored flame. Okay, the Star Elders are asking me to examine this flame a little further . . . I can see multiple doorways, and at the core I see a mother figure. It could be the Marys or the archetype of the Great Mother inside this flame that is beckoning us through those multiple doorways. She is standing there holding absolute love and purity much like what I felt when I was in Tintagel. It's that really strong, beautiful love and purity . . . beyond description. She is slowly going to send us through these doorways. They are telling me to call them "locks," as in the different stages within a canal. These stages are the stages of the growth of our lives. When we travel on this canal of life, we can only go so far before we reach a deciding factor in our lives, like a crossroad. Once we pass through the "lock", or crossroad, we can never go back. Then we move forward again and get a little further down the path, and we reach another "lock." Once we pass this "lock," we can never go back, as well. The reason we cannot go backwards is that once we have passed this pivotal point in our lives, we can never un-learn what we learned. That truth is with us from this point on. The Star Elders are going to take us step by step into a place where we can't go back to the old way of being-become shut down, armored, defensive or closed. This process is going to keep us wide open and take us back to the energy of the Great Mother. The Star Elders are going to take it nice and slow for us. It looks like there are quite a few "locks." We will know when we passed through each one. We are going to feel much lighter as each door closes behind us. We are going to feel our light enhanced and feel more resilient with each "lock" we pass through. We also might feel a little more vulnerable and a little more visible. For those of you in the circle who have always felt invisible in your life, they are saying "That's over. Get used to being seen." You are going to be seen. But you are so used to being invisible that this might make you feel a little like being in dreams we all have when we show up at school without our clothes on. (laughter). It's going to feel a little like this, which is exactly why we have those dreams to prepare us. Such dreams are not because we are afraid we are going to show up in school without clothing. Those dreams are us being afraid that we actually will be seen, and the Star Elders are saying, "Get over it. There is no going back." We have agreed to go through the "locks," Yes? They are not going to reverse the doors for us to escape anymore. So . . . if we are okay with this process right now, they will begin to take us through the "locks." The Star Elders and Archangel Michael also say the "locks" are a lot like a zipper. Are you okay with this? We need to give permission for their assistance. We have purified and clarified and have done much work on this pilgrimage (and those reading this as well). We are aware of a lot of what we have learned, but a lot of it we are not. We felt huge energy changes from really being weary to really being wide-awake, as we went through many levels of work. We are echoing what Kelly said the other day. "Good job. Well done. Well done." We are not the same. We even can look at each other now and see that we are a lot different by the way our faces have changed. We are different from when we arrived. We have merged with our core . . . the Great Mother that is within us. This essence is the light, truth, and wisdom that fill our chalice. When we go home, we will take this full cup with us. We are the weavers who weave the sacredness back onto the Earth plane. This "work" is facilitated by these kinds of groups coming to sacred places with love and respect. We recognize that we have been weaving our light on the Michael/Mary Lines. 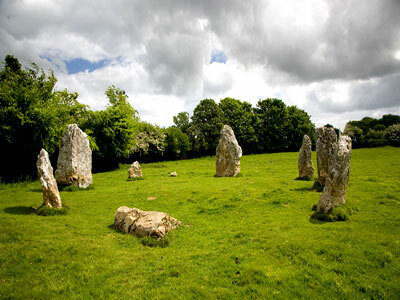 We also recognize the Ancients that anchored these ley lines in ages past. I'm feeling the guardians again-Joseph of Arimathea and Arthur-not quite as strongly as we did at Cadbury, which was mind blowing. They are also saying "Well done. Good job." They are pleased with us. The best way I can describe it is a profound recognition of who we are, not so much about what we have done or what we have accomplished, but the recognition that they know who we are and that we have come back. They are happy to see us again. So they thank us. We take a moment in our hearts now to thank all of them for watching over us and opening the doors and giving us surprises and opportunities and beautiful experiences and for helping us to understand the vastness and differences of energy between magical and flat-out bizarre. (laughter) We have fine-tuned our inner instruments to know what good energy does and doesn't feel like-what calls to our heart and soul and what is not to be energized by our presence anymore. We know where to plant our feet, and we know what to move away from. So we have long go released those misqualified energies that were anchored by the "old sides" of us (our former selves). Those energies will fade away because we are going to starve them to death by not participating in activities of the world that no longer apply to the focus in our hearts. "May the Camelot Hotel rest in peace." (laughter) That was Archangel Michael, not me. Remember . . . "We cannot un-learn light." Once we have learned something, we can't unlearn it. So once we wake up to something, we can't go back to sleep to that truth because it is already alive within us. So with that waking up comes a great responsibility, but all of us are ready for this. YES? As you may have noticed by now, the Star Elders and all the Guardians we work with never say "hello," and they don't say "goodbye" because that is linear consciousness, and they are coming from spherical consciousness. They just decide to quit talking. There is always a knowing that they will connect and see us again anytime we call on them. POST NOTE . . . This was the most courageous group-not afraid of giving their ALL to what it takes for themselves and humanity. THANK YOU.